We've shortlisted ten of what we think are the best staycation spots in the UAE to help you celebrate the summer in style and comfort. Most of them have beach access and a ton of fun activities to do. The Rixos Bab Al Bahr on Marjan Island has made much of its desire to attract guests from the emirates further to the south each summer. The private beach here is 345-metres long and sprinkled with private cabanas, while the resort also has a total of seven swimming pools – three outdoor, one adults only, one for kids and two spa pools for men and women respectively. If you have time, take a long, slow Turkish-style hammam in the resort’s Anjana Spa. There’s tons of restaurants too, so foodies will have no problem satiating their hunger. Head straight for Al Boom Dive School, it's best way to beat the heat is to spend anytime outside under the water and this leading PADI-affiliated dive school located on the property offers two-session introductory courses for beginners – one session in the pool, another in the sea – all for AED650. The resort also has plenty of above-water attractions, including Indian, Italian and Thai restaurants and several bars, and an unspoilt strip of beach. The hotel is also within reach of Snoopy Island, which offers some great marine life for snorkelers. For a staycation that manages to give the illusion that you’re in a completely different place in the world, then you need to head to Anantara. The luxury destination on the Palm Jumeirah is home to some of the most idyllic and picturesque accommodation across the emirate. It's home to a number of culinary gems and bars as well as a state of the art spa and pool. You can even go on a tranquil longtail boat ride around the crystal clear waters. Arguably one of the best hotel in RAK, certainly the most striking with its unbeatable beach-front location and opulent Arabic inspired interiors. Only a 50-minute drive from Dubai, it offers palatial rooms, stylish dining and an 18-hole golf course – so good it has won plenty of awards. With five pools, a spa, a fitness club and the beach at your disposal, the Westin Dubai Mina Seyahi Beach Resort & Marina is perfect for those looking for some r&r. The hotel is home to nine restaurants, all of which boast a number of mouthwatering dishes from across the globe. El Sur is perfect for those looking for a bit of a Spanish flare, Spice Emporium is perfect for Thai food enthusiasts while Bussola is home to some of the best Italian dishes in the region. The resort is set in an idyllic water inlet on Ras al-Khaimah’s beachfront, giving it a Santorini-vibe. Guests can soak up the sun on the resort’s picturesque private beach, unwind in one of seven massage rooms and check out the hotel’s seven restaurants has to offer. Cove Rotana’s summer packages include a one night stay in the room of your choice, a breakfast buffet at Cinnamon and a set dinner at Basilico Mediterranean Restaurant. Home to an 18-hole golf course and stunning views of both the Hajjar Mountains and the Arabian Gulf, Hilton Hamra is perfect for those looking for a little bit of R&R. Expect watersports like sailing and jet-skiing, as well as an outdoor swimming pool and seperate kids' pool. No more than half an hour’s drive from Dubai and with its sugary white beaches and sun-soaked landscape overlooking the Arabian Gulf, Ajman could be the most underrated emirate for a weekend break. It’s the newest of the UAE’s Fairmont properties, offering 200 metres of pristine beachfront, sea view guest rooms, a gym and spa, infinity pool and it’s only 10 minutes from Al Zorah Golf Club. It’s a great spot for family fun, in fact they promise to be “prepared to make every child’s stay magical”, which tells us that parents will get some downtime, too. 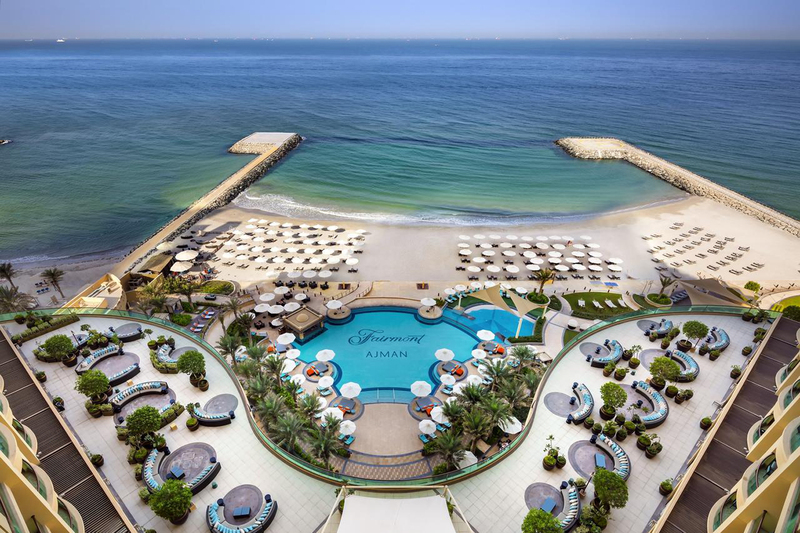 Stretching over a private sandy beach on Palm Jumeirah, Sofitel The Palm Resort exudes the perfect mix of tropical with chic French touches without a lot of mileage to get there. The low-rise buildings, trickling stream and the lush greenery of gardens designed by French botanist Patrick Blanc add a sense of calm alongside an impressive line-up of facilities that includes 14 restaurants and bars, six swimming pools, a state-of-the-art SoSPA, tennis, water sports... and très chic rooms and suites. It’s touted as an “urban sanctuary in the heart of the capital” and the impressive waterfront hotel couldn’t feel more like a retreat if it tried. Relax in the Mangroves lounge or at the infinity pool – or just chill out in your luxury room. We recommend trying the delicious and authentic Thai cuisine at Pachaylen and maybe a pre-dinner drink at Impressions, the stunning rooftop lounge. The setting is impressive, but you can really unwind by opting for a relaxing treatment at the Anantara Spa with two Vichy shower rooms a dedicated slimming room and the vast Turkish hammam, featuring two private hammam rooms, an open hammam area, sauna and steam rooms.